Decide the right time to mow. Do not mow if your lawn is wet or damp. Try to maintain a grass height of at least 3 inches during the summer and 2 inches in the fall and spring. Aim to keep the height to where you’re never cutting more than one-third off the surface at a time. 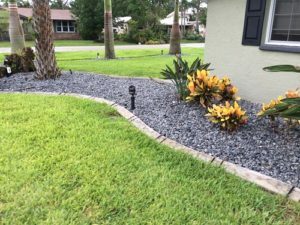 Maintaining good root growth is essential for a lush, green lawn, and one of the best ways to do this is to water your grass deeply but not too often. Overwatering will cause weeds to populate, and underwatering can make your lawn look dry and sparse. Pay attention for signs of wilting, like blades of grass folding in half, footprints on the grass remaining for an extended amount of time, and a grayish hue on your lawn’s surface. Also, a good rule of thumb is to water early in the day. When the sun is at its peak, typically around noon, water will dissipate before it has time to saturate the soil, and watering in the evening will leave the grass wet overnight, which can cause disease. If your lawnmower blades are dull, they will tear the grass and create ragged, worn edges. Always sharpen your blades after 10 hours of mowing so the cut leaf surface can heal more efficiently. Vehicles, bicycles, motorcycles – even footprints – can compact the soil and kill the grass. Save your lawn from damage by limiting traffic as much as possible, especially during times of drought and excessive heat. If your dog urinates on your lawn, this can cause unsightly dead spots. Treat it by soaking the areas with water to dissolve the urine in the soil. If possible, train your pet to use a graveled area for bathroom breaks. Don’t throw away those grass clippings! Leaving grass clippings on your lawn after mowing is called grass-cycling, and it can help you save a ton of money on expensive brand name fertilizers because it returns essential nutrients to the soil, including iron, potassium, nitrogen, and phosphorus. Follow these tips, and with a little patience and hard work, your lawn will look incredible in no time at all!